If you drive North from the Ontario area about an hour, tucked back between the tumbleweeds and smoke shops you’ll come upon the tiny town of Adelanto, California. 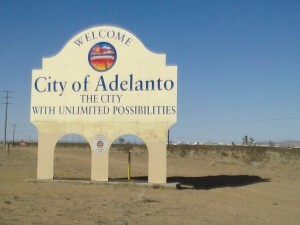 The population is just over 31,000, and the City’s marquee reads “Adelanto, the city with unlimited possibilities,” however, there is only one real reality…. detention. 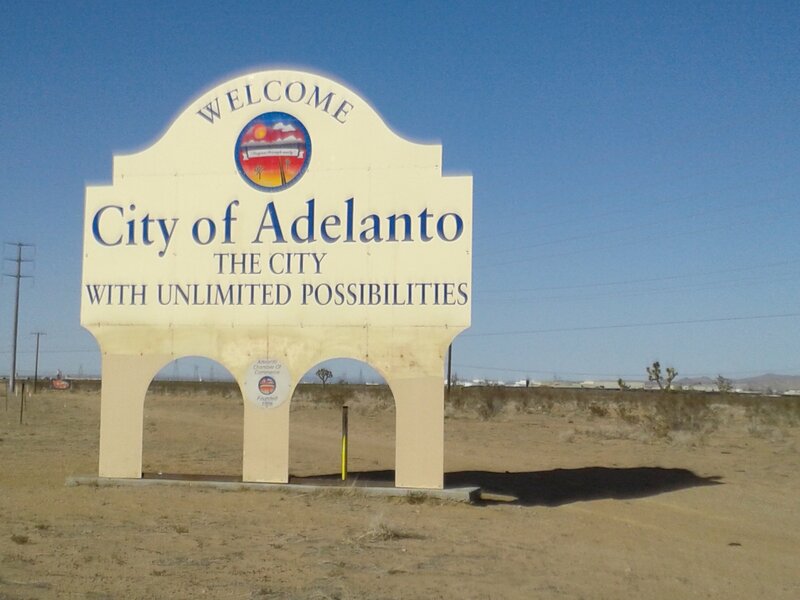 Not many people know it, but Adelanto has quickly become the detention hub of the high desert, with a federal penitentiary, the largest county jail expansion in the state, and within the last 17 months, add the largest immigrant detention center on the West Coast. While the opening of the for-profit immigrant detention center in Adelanto created some low skill (and paid) employment, it mainly serves as this generations latest addition in internment camps. The facility is owned and operated by the profit reaping GEO group, one of the 2 largest, multi-million dollar making, private prison groups in this country (although they also see massive revenue from their international facilities). While Immigration and Customs Enforcement (ICE) has technical custody of the detainees (or “customers” as I have personally heard ICE officials give reference to detainees) our tax dollars also pay GEO to run the facility. Due to the fact that the facility is private, workers there aren’t privy to the same benefits and securities as their Correctional Officer counterparts (although it’s the SAME job!). This may include lower earnings and ultimately lead to less investment in providing services, possible contributing factor to the death of a detainee at the facility March 2012. The facility houses male detainees from high level (and jail time served) criminal detainees, to those with NO CRIMINAL RECORDS. The facility stated that the average stay is 30- 60 days. For the detainees, that’s 30-60 more days away from their family, friends and loved ones. With the rural location of the facility, family visitation is little to non-existent. In fact with almost 1,300 detainees, sadly there are only about 30 family visits a day. Conditions at the Adelanto facility are even more isolated than lack of family visits however, with a continued lack of human contact through the court system. Without a right to an attorney, over 85% of those in custody will have to maneuver the complex system on their own. What’s worse is that there isn’t even personal interaction with the judge hearing their case. Court is conducted over television monitors, further dehumanizing the already degrading process. With an emphasis on humanizing the process, a small group in the Southern California area, Friends of Adelanto Detainees, has joined together to help end the isolation of detainees inside the Adelanto facility. With help and guidance from a national movement, Community Initiatives for Visiting Immigrants in Confinement (CIVIC), Friends of Adelanto Detainees is about to start holding trainings for visitors, and very soon, will be able to start visiting detainees. The purpose of the visitation program is to build friendships with those subject to the inhumane reality of the immigration system. The group cannot provide legal help, and does not proselytize. The goal is to simply be a Friend, have a conversation, and to listen to the stories of the men’s lives that are forever affected by detention. Working with groups in the Ventura, Los Angeles, Riverside and San Bernardino counties, another goal is to help provide resources and opportunities for family unification when possible. An example would be to help coordinate rides for family members to the facility with Friends members coming to visit. Sharing experiences is a way in which we connect as people. For those in detention, especially in Adelanto, Friends visits may be the only personal interaction detainees have with the outside world. The only way to have a voice in a system aimed at silencing those it affects. A way to know that they have not been forgotten. Hearing the stories of those in detention allows visitors to witness first hand the realities of our broken system, and ultimately will help to shine a light on the dark practices of detention. Visitors from all over the Southern California area are needed to help get the Friends of Adelanto Detainees visitation program off the ground. Trainings will be provided, to give more information about the Adelanto facility, the role of a visitor, and to help potential visitors prepare for the emotional and mental rigors of visiting. It can be heartbreaking to hear detainees stories, and not be able to physically help them through their struggle, but it is important to know that the compassion of a visitor plays an enormous difference in the lives of detainees. Once the program start, visits will take place Tuesdays (12pm-8pm) and Saturdays (7am-8pm). Potential visitors are encouraged to go to the website: www.FriendsOfAdelantoDetainees.wordpress.com for more information. No one knows what will happen in the future with immigration reform, what will happen to those that are currently in centers. The reality is that there are over 33,000 people in immigrant detention every day. These are our community members, our friends, our families. Mothers, fathers, sons, daughters. The hope of the visitation movement is to be Friends to those who face an uncertain fate. Please join us! This entry was posted in Uncategorized by cfialho. Bookmark the permalink.